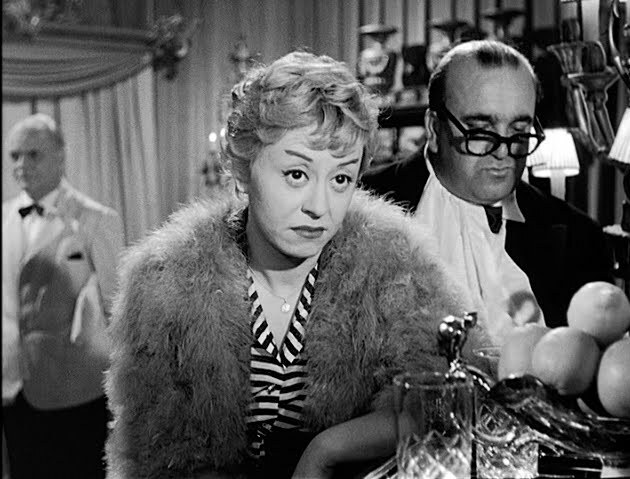 Yesterday I finally got around to seeing Fellini's Nights of Cabiria, which on the whole is just a wonderful, astounding movie, and I highly recommend it to anyone who hasn't yet had the pleasure (or hey, even if it's just been awhile). One aspect of Fellini's films that's often commented on, particularly in the Nights of Cabiria, La Dolce Vitia, 8½ run of films, is how fully he creates the world of Rome of the time. Now, granted, I've never been to Rome, never mind the Rome of the late '50s and early '60s. However, as a cinematic world, I understand it perfectly through these three films. 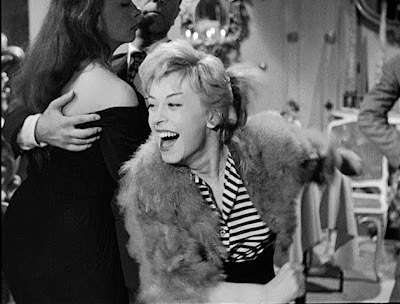 Rather than take a look at how it's fully created through the entirety of Nights of Cabiria, never mind the entirety of the latter two films, I want to take a look at the sequence inside the Piccadilly Nightclub, which really caught my eye yesterday. The club itself feels like a standard themed nightclub, but it's the people that are really special here. At every turn we're confronted with people, people who have pasts and opinions and mannerisms, rather than just a cavalcade of extras to fill the space with. Okay, first, check this out. 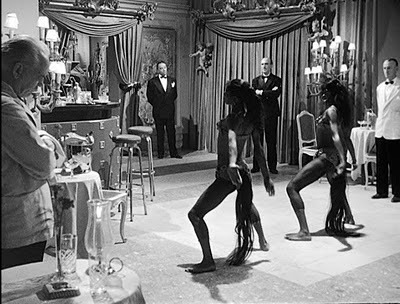 Seems to be a pretty standard establishing shot of some dancers at the club, right? But check out the guy all the way on the left side of the frame. Watching this in motion, he's actually nodding his head up and down, and in this frame, it really looks like he has his eyes closed. Given that he's standing, and dressed the same as the man opposite him in the room, who is standing attentively, I can only gather that he must be a member of the waitstaff whose shift is going on a little longer than he'd like. 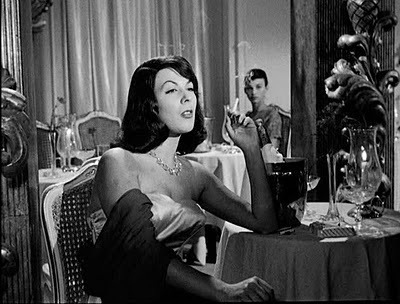 But then, for reasons that are never explained or even hinted at, when the nightclub's singer calls for a round of applause for Alberto, the man looks straight at him, almost condescendingly, and asks, "Must I applaud too, Alberto?" And that's it. We don't see Alberto acknowledge him in any way, but through this simple question and the manner in which it's posed, they clearly know each other in some way, to the extent that the man feels comfortably publicly placing himself above Alberto, a celebrity who clearly enjoys the favor of the town. 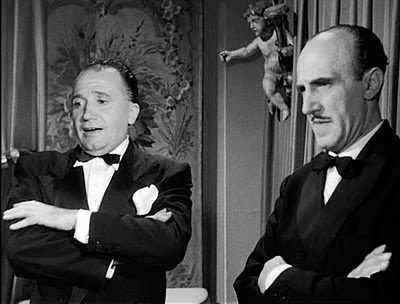 The doorman, who we first see helping Cabiria through the curtain, is seen here tiredly saying to his companion, "Mambo. The world turns around the mambo. What a mambo." 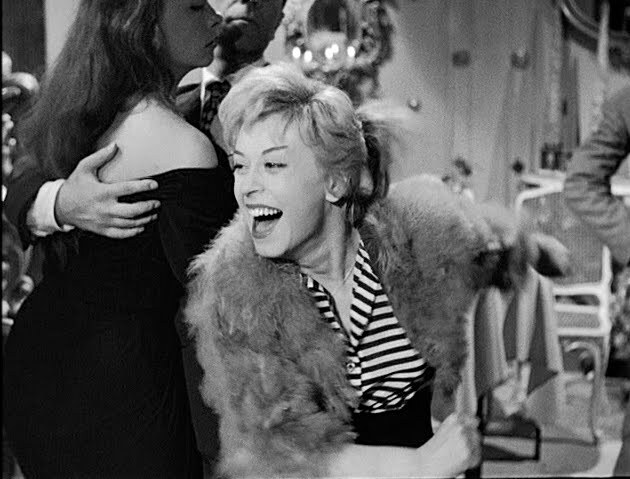 However, when Cabiria really gets into it and explodes in dance, he exclaims, "Oh, boy! What a mambo!" Bored with his job a little, perhaps, but this is still a man who can be surprised. ...and we see a woman, who we've seen before sitting totally alone, who is absolutely having none of it. 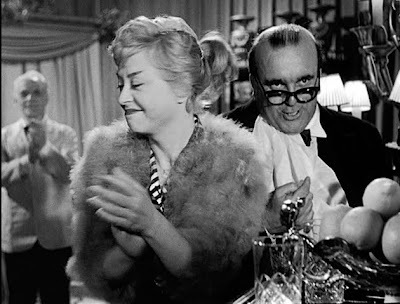 One could gather she's stuck-up, too good for the silliness Cabiria is indulging in, or simply jealous that it's not her on the dance floor with Alberto Lazzari. Probably the most intriguing patrons. We've seen the woman before, sitting with a group of other women, and although I couldn't spot the man before he and she start dancing, I doubt they came together. And yet, here they are, dancing together. 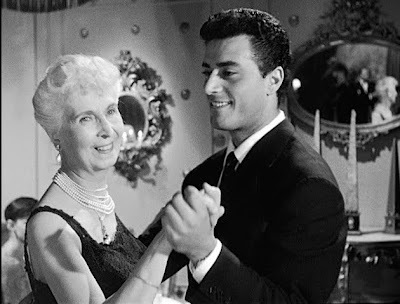 I mean, obviously, to each his own, but how often does one see an attractive, young-ish man picking up an elderly woman? Obviously, these are all small details, and not at all the point of the film, but that's exactly why it's so remarkable - these people are not integral to the film, and yet they feel fleshed out, dignified in their own way. They rarely feel like extras, but rather people who just happened to be there that night. And I just absolutely love details like this, details that show that this place, these moments, and really this film mattered to the director, and given that I've now spent much more time perusing the nightclub than the film actually does, clearly it's a world that matters to me as a result. Obtaining scrubs on the internet is really a less expensive option when compared with purchasing all of them within normal tote since you don’t possess to cover extra fake prada bags costs. A person can simply select from several styles on the internet as well as through presently there it is simple to purchase and also have all of them delivered to your dwelling or even replica watches uk very quickly whatsoever. Simultaneously, tote experts may also select custom scrubs based on their own individual choice. If you wish to appear great whilst doing all of your circular as well as this kind of gucci replica may also perform a great work within accentuating any kind of a part of the body. Also, they are a great choice whenever they would like to complement their own scrubs based on the style from the center such as the veterinarian or perhaps a pediatrician’s workplace. Nursing clothing which are comfy as well as moderate tend to be perfect whenever medical a baby or even baby. The most crucial products really are a medical bra which suits nicely which enables simple Tag Heuer 1500 Watches as well as protection. Following delivery, the actual bra dimension increases one to two mug dimensions. Some ladies will be enticed to buy the medical bra prior to having a baby, it's recommended to hold back before replica panerai offers are available in to make sure an effective match as well as performance.